The Event: An outside, nature-themed wedding (that was full of surprises) held on July 15, 2017 in Clinton, Montana, at a retreat center with a beautiful yard looking out onto a picturesque Montana mountain landscape. Keeping It Simple: When I was growing up, I was never a girl who dreamed of having a big, elaborate wedding one day. I never even really thought about what my wedding might be like until I got engaged. When I started planning for “the big day,” my (now) husband and I quickly decided we wanted to keep things as simple, low-cost, eco-friendly, and DIY as possible. We found a caterer who focuses on local and organic food, recruited our parents to help with DIY decorations, and designed small and simple invitations to reduce paper. We knew that our top priority for a gift registry would be a honeymoon fund for our planned three-week trip to Europe. While searching for a free online registry tool, I came across SoKind and immediately loved it. A registry that encourages the gifting of experiences, secondhand items, funds, and charity donations—it was perfect. We did end up listing some new items on our registry, but we made an effort to limit those to items that we needed and knew we’d use. In the end, most of our friends and family donated to our honeymoon fund—and with that we were able to more thoroughly relax into our trip. Nature’s Surprises and Lessons Learned: While we did (mostly) manage to accomplish our goal of having a simple and low-impact wedding, what we learned on our wedding day was that no matter how much you plan, or how detailed your dreams, things probably aren’t going to turn out exactly how you expect. 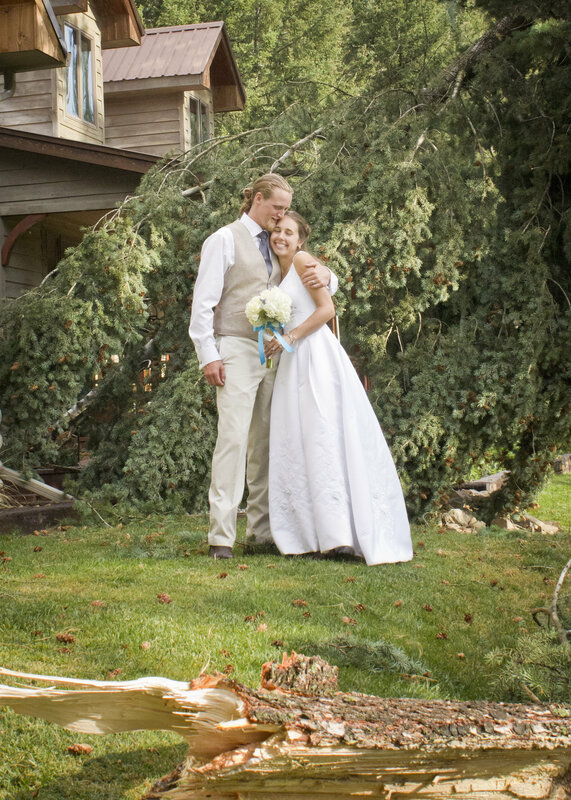 On the day of our wedding, a microburst wind storm blew in at the exact moment I was walking down the aisle. Hit by the intense wind, two trees crashed to the ground, missing my parents and me by about 30 seconds. Confusion ensued—some guests ran for the house, while others ran for an open, treeless field. Luckily, we were able to get everyone inside before the rain hit. Without hesitation, we decided the show would go on: a few amazing friends and family did a quick decorating job inside the retreat center in a room that, luckily (because the power had also gone out), had a huge beautiful cathedral window. After the ceremony, the sky cleared, we did a quick clean-up job at our reception spot (the white tablecloths and blue tin dishes were, at this point, soaking wet, muddy, and blown all around), our band used hairdryers to dry their equipment, we regained power, and we had a wonderful night. Later, in the days and weeks following the wedding, so many of our guests complimented Lowell and me on our perseverance and ability to stay calm throughout the wedding excitement. In reality, I think we may have been in a bit of shock, but we also knew that we were surrounded by so many of our loved ones and that, no matter what, it would turn into a beautiful and incredibly memorable night. The entire wedding experience (from planning to honeymoon) taught me a lot, including that “keeping it simple” can be harder than expected. It also showed me that—no matter what—family, friends, laughter, good humor, and good times are so much more important than perfect agendas and table decorations! To read more stories in our "Real Celebration" series, visit the SoKind blog.